One of the newcomers is 38-year old Bom Kim, founder of fast-growing e-commerce site Coupang and also the youngest person to make the list this year. He is featured in the cover story. SINGAPORE (April 28, 2016) -– Samsung Group Chairman Lee Kun-Hee is the richest person in South Korea, for the eighth year in a row, with a net worth of US$12.6 billion, according to the 2016 Forbes Korea Rich List. However, his fortune like most others on the list fell in the past year due partly to a sluggish global economy and slow domestic growth. The complete Korea Rich List can be found at www.forbes.com/korea and in the May issue of Forbes Asia and June issue of Forbes Korea. The 74-year old Lee Kun-Hee remains No. 1 on the list despite losing $700 million in the past year. His only son, Jay Y. Lee, ranked No. 3 on the list with $6.2 billion, has been running the Samsung Group as the elder Lee is still recovering from a heart attack nearly two years ago. Lee Kun-Hee’s net-worth figure includes $1.2 billion in Samsung Electronics shares held by his wife, Hong Ra-Hee. Suh Kyung-Bae retains the second place on the list with $8.4 billion, down $800 million from $9.2 billion previously. Benefitting from the global interest in all things Korean, the 53-year old Chairman of cosmetics giant AmorePacific promises to nearly triple sales to $10.7 billion by 2020 and plans to expand in the Middle East this year. His company’s Innisfree brand opened its 200th shop in China last December. outfit IS Dongseo and Kim Seung-Youn of conglomerate Hanwha. Holdings, one of South Korea’s leading gaming companies, which he started in 2002. Seven people made the list for the first time this year, including four new billionaires. One notable newcomer, Lim Sung-Ki, catapulted onto the list at No. 7 with a net worth of $3.9 billion, after shares in his company Hanmi Science soared 226% over the past year. His friend, Shin Dong-Guk (No. 31, $1.1 billion), who invested in his pharmaceutical company, also debuts on the list as a billionaire. New to the list are founders of the country’s two biggest unicorns (startups valued at $1 billion or more by investors), Lee Sang-Hyuk (No. 34, $1.05 billion) and Bom Kim (No.36, $950 million). Lee’s 26% stake in the fast-growing technology incubator Yello Mobile, valued at $4 billion, hoists him into the billionaire ranks. Featured in the cover story of Forbes Asia, 38-year old Bom Kim, founder of fast-growing e-commerce site Coupang, is the youngest person to make the list this year. Coupang offers same-day delivery with its last-mile delivery network of customized trucks, algorithm-controlled warehouses and 3,600 “Coupang-men” who deliver goods across South Korea. Making his debut and also the oldest person on the list is 81-year old Kim Jae-Chul (No. 10, $2.5 billion). He started his company Dongwon Group in 1969 and it is now the country’s largest deep-sea fishing company, known for its canned tuna. Third-generation heir of Daelim Group, Lee Hae-Wook (No. 43, $850 million) and private-equity player Michael Kim (No. 47, $735 million) of MBK Partners are the other newcomers on the list. The minimum amount required to make the list was $680 million, up from $665 million last year. The list was compiled using information obtained from the individuals, stock exchanges, analysts, private databases, government agencies and other sources. Net worths were based on stock prices and exchange rates as of the close of markets on April 15. Private companies were valued by using financial ratios and other comparisons with similar publicly traded companies. lifestyles. The company publishes Forbes, Forbes Asia and Forbes Europe magazines, as well as Forbes.com. The Forbes brand today reaches 94 million people worldwide with its business message each month through its magazines and 37 licensed local editions around the globe, websites, TV, conferences, research, social and mobile platforms. Forbes Media’s brand extensions include conferences, real estate, education, financial services and technology license agreements. Licensed in 2003, Forbes Korea is a monthly Korean language publication by Joongang Ilbo, one of South Korea’s leading media conglomerates. 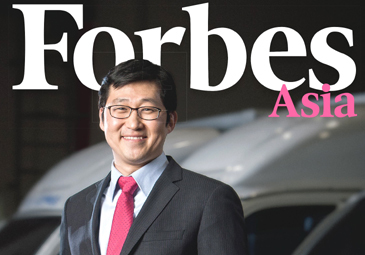 About one-third of Forbes Korea’s content is from Forbes and Forbes Asia; the rest are local stories. Content include news on South Korea’s entrepreneurs, celebrities, and philanthropists as well as on the lifestyle and insights of the rich and famous in Korea.